It’s taken a while but I have finally got around to listing all our gear and reviewing most of it. So for anyone interested – take a look. 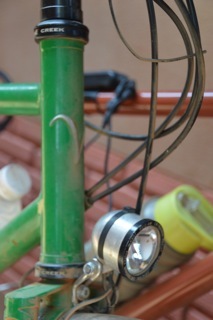 Our bikes are custom made Jota’s, built by Tim Stredwick of Velosmith in Tasmania. We chose to go with dedicated touring bikes because it was an excuse to get a new bike and because neither of us can claim to be any kind of bike mechanic. 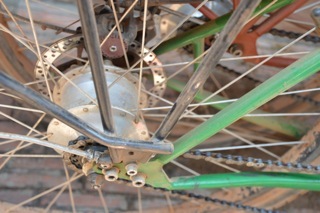 Plus we like the idea of getting locally made bikes from someone who has decades of experience touring all over the world. The bikes are steel frames with Rohloff hubs, Tubus racks (except Astrids rear rack which is welded on and part of the frame), Brookes flyer S saddles, mechanical disc brakes, Schwalbe Marathon Mondial tyres, Son dynamo & Busch and Muller lights. So far our mechanical problems on the trip have been nil, which we think is pretty good considering some of the corrugations we rode over in Australia. I had one flat in QLD and Astrid had 2 in Malaysia. 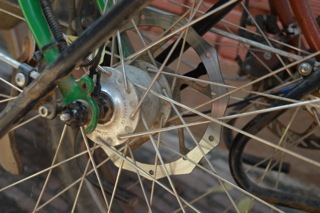 Our chains stretch and we need to move the wheels back after a few weeks of cycling, or take a link out. Unfortunately when Astrid fell off on the Savannah way she somehow managed to break her front light, which is covered by a 5 year warrantee but we are still waiting to see what will happen with that. See www.velosmith.com.au for all the specifications if you are so inclined. 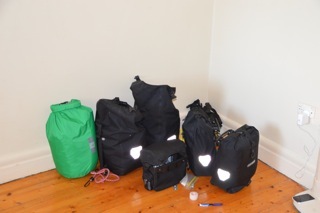 Panniers: While most of our gear was sourced locally in Melbourne, we bought our panniers from thetouringstore.com as the price difference was too large to ignore. Like most touring cyclists, we went with Ortlieb, specifically the front and back roller plus and the medium sized handle bar bag. Aside from the universal complaint about them not having pockets, they have been excellent so far. We also have a pannier carrier system that can click into the back of the small or large pannier and effectively turn it into a backpack. This has been very useful for when we go trekking or sight seeing. Bike repair: Spare tubes (2) repair kit (2) pump (2) chain breaker, spare spokes, spoke key, spanner, Allen keys, chain oil, spare chain, Leatherman, Rolhoff oil, brake pads. Most importantly World Nomads Travel Insurance which does cover you for cycle touring as your primary mode of transport. We upgraded to level 2 which includes skiing, diving to 30m and altitude. We also have unlimited repatriation back to Australia. It wasn’t the cheapest, but I believe it’s probably worth it if things go horribly wrong. 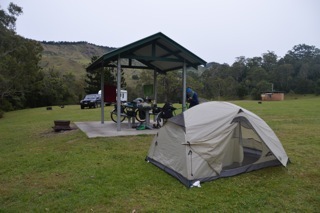 Tent: We bought our tent (and most of our new gear) from Bogong in Melbourne. We consciously decided to try and source our gear locally, even though some of it (like icebreaker) is now sadly made in China. Our tent of choice is the Mont Moondance III, including footprint. 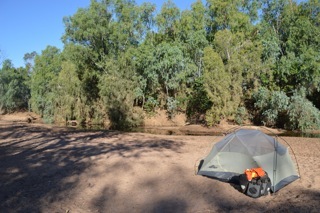 Almost every night in Australia was spent in the tent and aside from the odd patch it has held out well. It was definitely worth getting the footprint to protect the floor. This tent is particularly good in dry, hot climates as from about a third of the way up the wall it is all mesh. 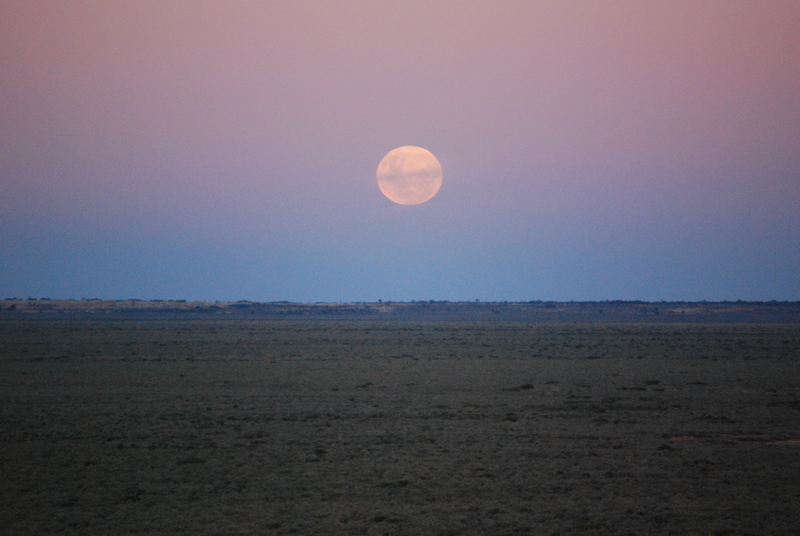 We had brilliant, cool nights in outback with the fly off in Australia, gazing up at the moon and stars. This tent is a 3 man and as it is our home most of the time, so it’s nice to have the extra room. The tent lives in a dry sack on our rear rack. Mats: Exped down filled in inflatable mats that weigh 760 grams. I have the 163cm X 52cm and Astrid the 183cm X52cm. These mats have been amazing so far. Because we are travelling for so long we also invested in inflatable Mountain Design pillows. They don’t take up much room and are much nicer than stinky clothes pillows! We both have a sleeping bags, Astrid’s is a Mac Pac, which goes down to about – 18 and mine an on sale Kathmandu, which goes down to about -12. A silk liner acts as our sheet to keep the mats clean and we bought a sheet from an Op shop for warmer weather and to keep the sleeping bags clean, which we usually use like dooners. Stove – MSR XGK EX – Aside from being irritatingly loud, the stove has been great. After 4 months of being used at least twice a day, everyday the pump cup needs to be replaced, but otherwise we just clean and service it like the manual advises. In Australia we used Shellite and Kerosine but have now switched to petrol as you can get it from the side of the road here for about 70 cents. 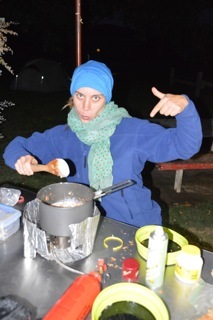 We have a large and medium sized MSR pot, wooden spoon, spatula, a sharp knife & a blunt one (courtesy of the side of the road) 2 sporks & 2 bowls (side of the road) & 2 cups. We did start with sea 2 summit bowls that fold into plates/chopping board but we found that they did not last the distance when used everyday. The silicon broke. We still have one, which we use as a chopping board though. I think for everyday use its better to stick to basic items, rather then specific light weight camping ones. We also have a small collection of spices, which we carry in never used urine specimen jars (thanks NH). These are excellent, keeping everything sealed and not taking up too much room. And spray on olive oil. Much better than a leaky, heavy bottle. Cycling: Both of us cycle in non lycra, non padded shorts. While Astrid has nearly killed her second pair (arse of steel?) I am still on my first. Some hiking shorts I bought from Bogong made by Outdoor Research. Astrid wears an Op shop long sleeved shirt and I have switched from a light weight (150) icebreaker marino thermal because I found too tight and hot to a long sleeved shirt as well. If it’s cold we add thermal leggings or skins. Neither of us like cleats and we both now cycle in Tivo’s (Birkenstocks died after too many river crossings in Australia). This might seem strange to a lot of cyclists but heaps of people that tour for long periods don’t wear special cycling footwear. After cycling more than 6500km without cleats, power grips or toe clips we don’t feel like we are missing out. 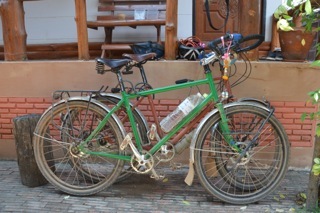 This trip is as much about travelling as it is about cycling and we feel keeping things simple suits us best. We carry a pair of hiking boots for cold weather or trekking. Wet Weather: Ground Effect Sheshell, hiking overpants (for really wet & cold miserable weather). The raincoat in action. It has not had much use yet. Cold Weather: Icebreaker 260 Marino thermals, leggings and long sleeved top. Down jackets & polar fleece. Base layer gloves. Beanie & icebreaker neck thingy. Off the bike: spare pair of hiking pants (and now also hippy pants), t shirt, singlet top and long sleeved hippy top. And a dress, just incase looking nice is required! And maybe a few accidental bonus singlet tops and t shirts from friends. Sarong, useful for everything – beach towel, skirt, dress, scarf. Quick dry towel. Sun hats & sun glasses. 2 packs of cards and scrabble pieces. Technological stuff – it is the future and we have reluctantly embraced it. A Mac book Air – no problems so far, great for google maps, blogging, storing photos, looking up travel info and watching films/tv shows. I think we are both pretty happy to have this along. It makes life a lot easier, especially in Asia where wifi is everywhere and often free. I pods – for music, podcasts and books. 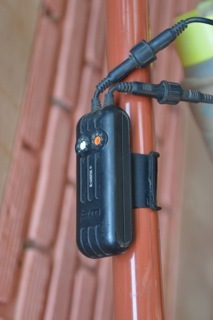 Especially good for long periods of outback cycling or when in noisy Indonesian traffic or dull highways (which thankfully is not that often). Kindles – so we don’t have to read crap. We are slowly working our way through the classics, as well as fascinating books about the countries we are visiting. Camera – Nikkon digital SLR with a Tamron lens 18mm-260m. An e werk which is a device that attached to the dynamo and charges all our electric devices, bar the computer. Vests – we both ride in very attractive fluro vests when the visibility is bad or the road is busy. Take a look mirror – a mirror that attaches to our sunglasses that allows you to see the traffic behind you. 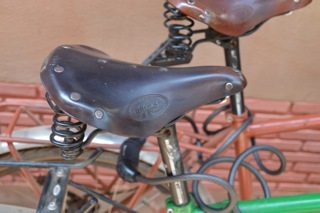 Can be used for right and left hand cycling. Helmets – thanks city of Melbourne. Water filter – we use a Sawyer gravity fed filter. In Australia we used it a few times for river water, but in Asia we use it everyday. I think it will be a while till the tap water of the country we are in is drinkable again and we really didn’t want to be part of the epic plastic water bottle catastrophe that has taken hold in most of Asia. Water bags – 2 4L MSR water bags and 2 6L MSR water bags for carrying extra water. They take up very little room when empty and we carry a bit if extra water most days in Asia and carried it to the full capacity in some parts of Australia. 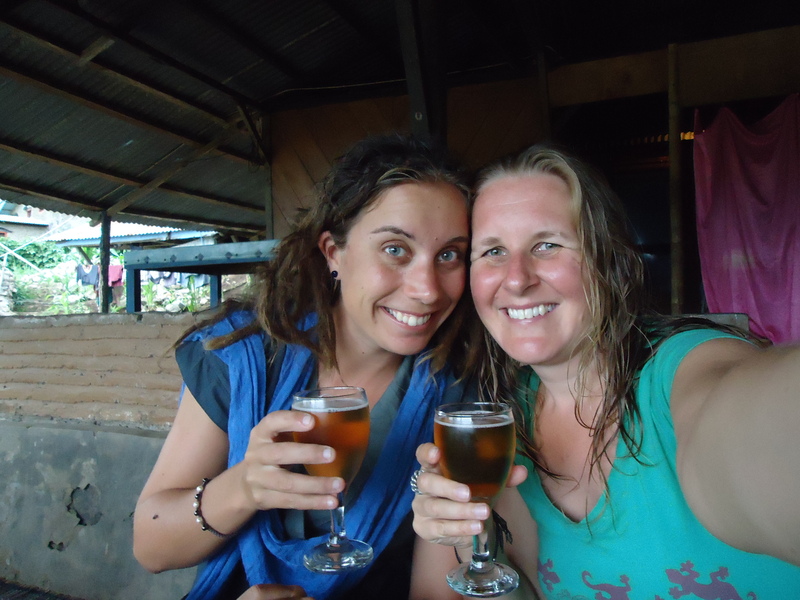 The day we packed – it was a little overwhelming and Ginger beer was required! It’s 9 days until we leave. Everything still feels quite surreal. I have said goodbye to people I may not see for a few years but the meaning of what that actually means alludes me. The other night I said to Astrid that I feel almost numb about the whole thing. Occasionally I get moments of clarity where it hits me that we are actually going away for a long time and how much I am going to miss people but most of the time I am thinking about what we have to do next; where to get boxes from and what item of clothing we still need. Things have been hectic to say the least. I have never packed up my life before and it seems that when you are not busily packing and cleaning, you are having last minute drinks with friends or seeing family. I guess things will start to sink in more once we are out of our lovely house. We have hardly looked at the bikes over the last week, which will probably mean a painful first day. Hopefully next week we will get more of a chance to go on a few rides. It feels like once we have moved out things might settle down a little. Anyway, I will aim to write more next week, including a bit about our gear as I know the outdoorsy, cycling types will be interested. Our leaving year was set for 2013 and eventually this was refined to the 6th of April. At the time of making the decision it was early 2010 so the whole thing didn’t seem so real. We slowly began telling people of our adventure, although I am not sure how many actually believed we would do stick to our word. The plan seemed so immense and so far in the future and often these dreams don’t seem to make it to leaving day. Over the next few years I went through many different emotions regarding this trip. This isn’t something that is often talked about in the cycling blogs that I have read. I am not sure if it is because people are leaving jobs that they dislike, or they are retired and secure or maybe just braver then me. Although I was often excited to the point of dancing around the house, this was juxtaposed with a mild feeling of terror and anxiety. Not because I was scared of what was out there in the world, more because there was actually no reason to leave. I actually liked my job a lot, loved where I lived, had great family and friends and enough holidays per year that I could easily go cycle touring every few months. To be honest I was a bit scared of leaving this comfortable, relatively easy existence and going out into the great unknown. I had never been away from home for more then 3 months either and that worried me too. What if I hated it? Or go so homesick that I couldn’t stand it anymore? Who was I without a job, without a home? Without friends and family around? What if Astrid and I fought a lot? What if I whinged so much she would hate me? I had an on and off mild existential crisis. Slowly, out of the fear came the reason for such a journey. It was probably the unconscious reason as to why I was drawn to such a trip in the first place. Only it got lost in the loud chatter of my anxiety. Hopefully I can put into into words. And Astrid might have a totally different reason of why she is doing this but for me it goes something like this; part of it is definitely adventure, to see and experience cultures that are different from our own. To try and understand the world more fully. On a bike this is much easier then by other means, people are more likely to engage with you and you are more likely to get off the tourist trail entirely. The other part is more personal. I want to be challenged, physically, emotionally, spiritually. Who am I when I am without all those things I mentioned previously? It would be so easy to stay at home, my life is good, but I want to face the things that challenge me and see how I come out the other side. This trip will be an adventure and to use fear as my motivator not to go would be something I would regret forever. After realising this, my apprehension subsided immensely. Most of my fear is gone, replaced by excitement, anticipation and acceptance. I never planned to cycle to Scotland. Cycle touring, a bit like our trip seems to have organically imbedded itself in my consciousness. It started with the thrilling purchase of a bike in my mid 20’s following many false starts when I thought I should be loving cycling but really hated it. I eventually fell in love with the freedom of commuting, the feeling of really being alive and in the world as you whizz past those unfortunate individuals stuck in peak hour traffic. Not to mention the automatic prime parking. Commuting progressed to weekend rail trail rides with friends. Later, some of my friends started doing something called cycle touring, my interest was sparked. Then I had a few chance meetings with some inspiring individuals who had cycled vast parts of Europe and Australia and before I knew it I was climbing a pass in New Zealand on my first solo cycle tour. Then I met Astrid. Beautiful, adventurous Astrid. Not long after our meeting we were sitting in a bar in Northcote when the topic of travel came up. We both admitted that we would love to travel from Australia to Europe, overland. I should have known then where this would lead. 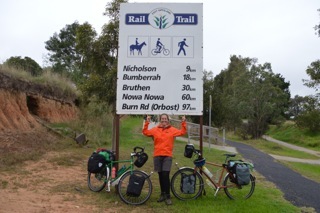 Some weeks later the topic of bike touring reared its head. While Astrid commuted everywhere on her trusty bike Tulula (now sadly stolen) she had never bike toured. So that became our working plan. But some ideas cannot be contained and just grow, quite of their own accord. So our’s grew, seemingly quite naturally into a bike tour from Melbourne to Scotland. 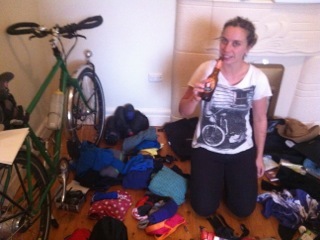 So now it’s just under 3 months until we cycle out of Melbourne and into the unknown. Well, into Warburton really. We have our first day planned but after that we have no idea other than Sydney by 28th of april and Darwin sometime in late July. This blog is a way to document our experience, both for ourselves and our family and friends. We hope many of them will join us throughout our journey.